Chances are high that, if you love Dark Souls 2 as much as I do, you've uncovered most of Drangleic's secrets by now. You've found King Vendrick, you've killed in the name of the Rat King, you've participated in some jolly co-operation. Maybe some of you even finished the game in 20 minutes , thanks to some amazing glitches. But that doesn't mean you're done dying: From Software has three pieces of DLC on the way for Dark Souls 2, called The Lost Crowns, and you can buy a season pass on Steam for it right now. The pass costs $25 and will include "3 DLC packs unlocking 3 brand new areas, fearsome new bosses and hosts of new enemies and contents," according to the listing. The news comes with a trailer , showing off some new environments from The Lost Crowns. 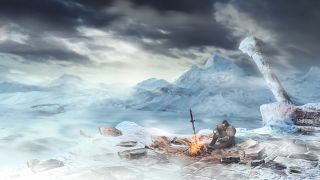 Publisher Bandai Namco says the first episode "sends players on a quest to reclaim the Crown that King Vendrick once owned. With an entirely new areas to explore within the Dark Souls II universe, players will find pyramids, underground caverns, and unknown foes. It is said that the Ancient Crown is buried deep below the surface, but surely it cannot sit unguarded?" The second episode, The Crown of the Old Iron King, references one of the main game's bosses—a monarch-turned-demon who battles the cursed player in a massive lava pool. It'll be interesting to see what we discover about the Old Iron King in the DLC, as many fans have theorized about his relationship to other characters in the game. Still haven't explored Drangleic? Read our Dark Souls 2 review , as well as our tweak guide from modder Durante.